The stairwell installation posed unique challenges. The sculpture needed to be successful from multiple vantage points and from various distances. It also needed to relate seamlessly to the stairwell structure and all the other dynamic architectural features in its surroundings. On the first day I visited the construction site, I gazed through the large window from outside the house and imagined driving up the road and catching a glimpse of the light as I approached. This would be the first key view. I stepped through a frame that would later become the front door and rounded the bend to the stairs. I noticed an ethereal, bright, natural glow at the top of the stairs coming from both the front window and many windows in the green room (the room at the top of the stairs.) As I ascended the stairs, I considered the second key vantage point, the view from below as you walked up to the second floor. I then examined the third viewing angle, from the green room and rooftop garden beyond looking back at the piece. The challenge in designing a sculpture that would feel resolved from all these vantage points was intriguing, and I was anxious to dive in. Starting this project when the bones of the house were still exposed and hadn’t yet been covered in insulation, plaster, and drywall informed my design process in many ways. Being able to examine the snake-like wooden interior handrail allowed me to break down the dynamic form of the whole stairwell in terms of movement and flow. 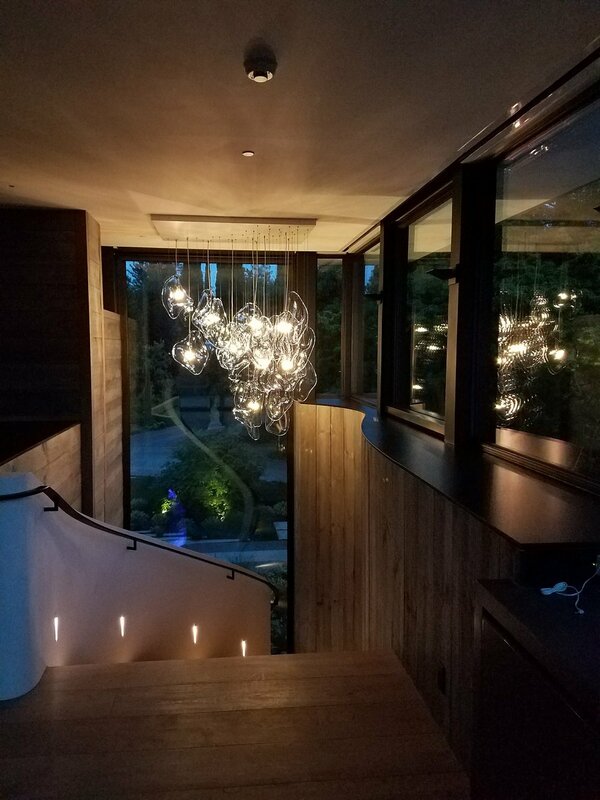 Complementing the swoops and curves of the staircase meant creating a sculpture with curvilinear elements both in the glass parts themselves and in their arrangement. 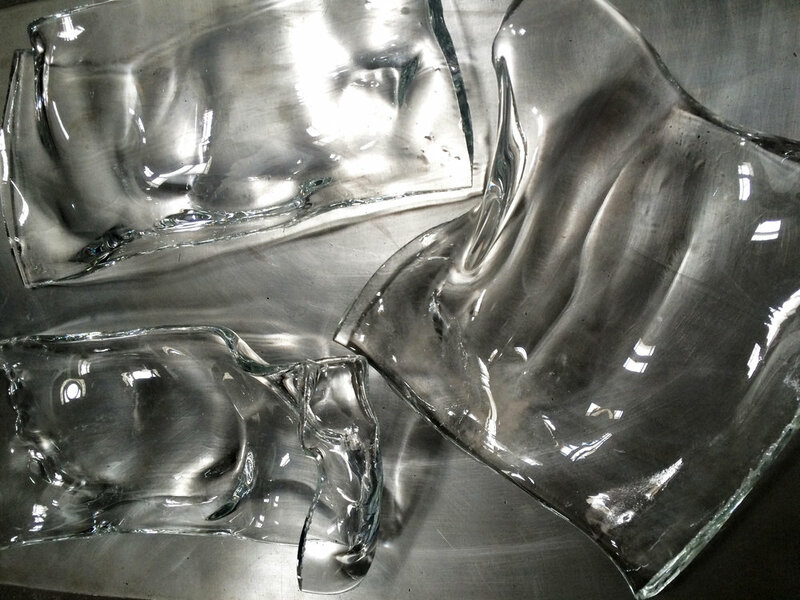 Using ice, glaciers, and water as inspirations, I iterated many times on the shape of the glass parts before arriving at the soft, organic, thick and thin clear rondels of the finished piece. Design iterations included experimenting with slumping sheet glass over hand-sculpted rock forms, reenacting traditional sheet glass-making processes, and manipulating hot glass with hand-tools to create unique optic affects. The composition of glass plates, created through variations in drop lengths and the position of suspension cables off the ceiling plate, established another layer of connection between the sculpture and its architectural surroundings. The arrangement of points evolved from a grid to an exponential curve while the drop lengths morphed from a diagonal to a helix form. These design transitions resulted in the gestural quality that gives this sculpture life. Achieving a successful design for the various distances from which the piece would be viewed initially seemed like an obstacle. However, it ended up inspiring one of the main design concepts of the piece. Unlike traditional lights that have a light source enclosed in a glass shade, I wanted to deconstruct this light assembly and use the flattening effect of distance and perspective to make the light to appear to be resting on or sitting inside the glass. Consequently, from afar the light sources look like shiny little pearls on the glass plates, while simultaneously existing as distinct and intentional sculptural elements when viewed from up close.